Our dogs are no problem, they love the car, van or truck and going for a ride is always an exciting time for them so all we have to do is pop the back door on the SUV and up they jump! The cats are a different problem and not as easily transported so we have a medium size kennel that we could actually put them all into for emergency evacuation. But the birds … now they present different challenges. The first thing to do is make certain that you have adequate “housing” for your companion parrot(s). 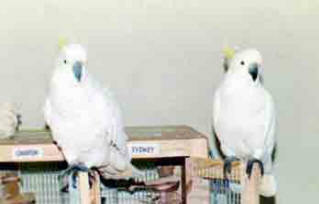 There are many travel cages available; acrylic ones allow for lots of light, the collapsible ones are easy to store and the airline type kennels can be easily modified for travel and temporary housing (purchase the type that have metal bars instead of plastic so your FID doesn’t chew his/her way out). These are really NOT designed for buzz saw beaks so make sure you do your homework. Remember, this may be their “house” for an undetermined amount of time so it must be safe and relatively comfortable. Make sure you have at least one perch, a water bottle, bowls for food, pellets, etc. 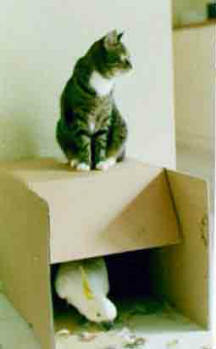 Also pack something familiar (like a favorite toy) to help reduce anxiety for your pets (dogs, cats AND birds). Keep the travel containers EASILY accessible (don’t break them down and put them in the back bedroom behind the Christmas decorations) and place the following inside so everything is in one place: bottled water (and a sprayer for misting), an ample supply of pellets, vacuum packed seed and nuts, freeze dried or dehydrated fruits & vegetables, canned vegetables (preferably no or low salt variety), apple sauce, even small jars of baby food fruit and veggies will work for variety, a can opener, paper towels, a couple of towels or a blanket, flashlight (pack fresh batteries stored outside the flashlight, a bottle of waterless, antibacterial soap for YOU, and a first aid kit*. Once this is set up, mark your calendar to rotate the perishables on a monthly or quarterly basis (depending on what you have "packed"). Then forget about it, relax and enjoy your feathered and furry family! *Don’t wait for an emergency to look for your First Aid Kit – if you share your life with a parrot, you should have an Avian First Aid Kit readily available. There are commercial ones available or you can put together your own (ask your avian vet for help). Get a waterproof or water resistant container, clearly mark it as FIRST AID KIT and fill with bandaging material (gauze pads, one cloth tape, sterile bandage pads, vet wrap and include some band aids for YOU), latex gloves, scissors, hydrogen peroxide, sterile cotton applicators (like Q-tips), tweezers, hemostats, penlight, eye dropper and Kwik Stop or a clotting agent (you can even fill an old, CLEAN prescription bottle with some cornstarch which is non-caustic).